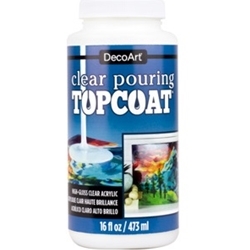 Pour over acrylic paintings to achieve a high-gloss, lacquer-like finish. This one-step formula eliminates the need to mix harsh chemicals and flows into a self-leveling coat that will not yellow or bubble. Cures to a crystal clear, hard finish.